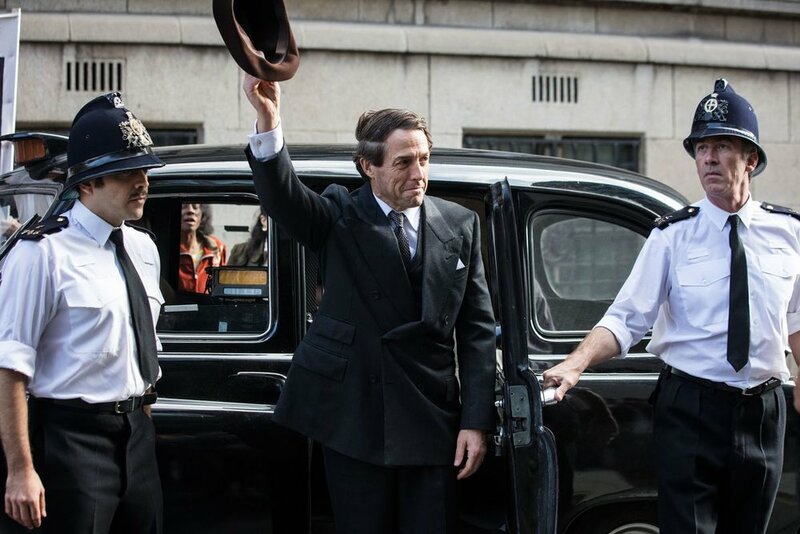 REVIEW: "A Very English Scandal"
Hugh Grant is having something of a career comeback, after his hilarious turn in Paddington 2 and now his darkly funny and sharp edged performance as Jeremy Thorpe in A Very English Scandal, a superb BBC miniseries concerning one of the most astonishing political scandals in British history. Director Stephen Frears also does some of his best work here, as the three brisk hours it takes to relay this insane series of events absolutely fly by, never a dull moment or dry line of dialogue spoken as we’re swept back into the past and placed in the minds of Liberal MP Thorpe and his twenty-something lover Norman Scott (Ben Whishaw), whom he eventually conspired to have murdered (really). Grant inhabits the perfect amount of perverse cheekiness as he seduces the young man in 1962, brazenly bringing him to his mother’s house and putting him up in a hotel room for a period of years (at a time when homosexuality was still illegal in Britain), before tiring of him and attempting to send him away as he aspired to climb the political ladder, even becoming Leader of the Liberal Party in 1967. But Norman Scott wouldn’t vanish so easily, and Whishaw plays him as an openly gay man who freely drifts his way through life, attaching himself to people (men and women) who momentarily give him some direction before always coming back to blaming his misfortunes on the ill-fated affair with Thorpe. For his part, Thorpe also blames Norman for anything that goes wrong in his own life, from his wife’s death to the allegations against him that he has squashed by the police over a number of years in the 1960’s. Eventually Thorpe fixates on having Norman killed, which leads to an extremely bungled assassination attempt in the mid-1970’s, the aftermath of which reveals the depth of the scandal to the public and plays out in the press in sensational fashion. If you didn’t know anything about this historical episode (I didn’t), the show is especially fascinating and enormously entertaining, playing out as a playfully dark comedy, all the more stunning given the truth of the details. In some ways it’s the English equivalent of I, Tonya, involving incompetent hitmen, clumsy blackmail attempts, and Thorpe's increasingly desperate moves to cover his tracks and deal with the oblivious and naive, yet determined Norman. And still there’s a core sadness to this affair, as the deeply closeted and self-loathing Thorpe envies the freedom Norman possesses to accept himself, while the system’s unbending and predictable outcome in delivering justice to the oppressed is a stark reminder of the way the powerful never fail to close ranks and protect each other even in the face of all evidence and hypocrisies. Grant and Whishaw are fantastic as the two leads, deft at carrying the tone through the three hour-length episodes, and are ably supported by an ensemble of actors including standouts Alex Jennings, Eve Myles and Blake Harrison. Check this one out, people- it’s well worth your time and one of the best shows of the year.